Here is my first Wednesday Quick Tip for Adobe Illustrator. 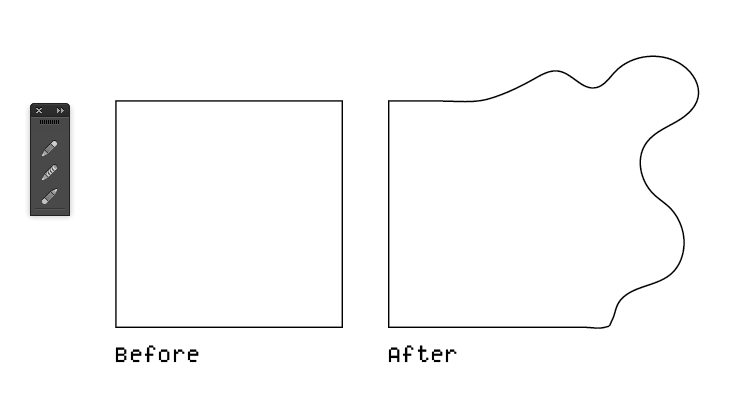 Using the pencil tool, you can quickly reshape any path. Select the object that you want to edit. Then using the pencil tool, draw a new shape for the path. You MUST start drawing on (or very close to) the original path AND finish on the path. Below is an example. I took a normal square and using the pencil tool, reshaped it into some half-blob thing. Using the pencil tool, reshape an existing path. If you are having issues with this tip, make sure that your path was selected before you started to redraw the path and make sure that you start and finish redrawing on or very close to the path. While the example is somewhat extreme, it's a very handy tip for polishing shapes or cleaning up rough edges. Every Wednesday I post a quick tip for an Adobe app. You can see them all on my Quick Tips page.